3/29/91 8:45 am at Deer Creek Vision Cairns near Lake Creek. ¶ I am appalled at the devastation since I was last here. The meadow that is the approach to this vision quest site has been cut through by a logging road which gave access to many of the woods which have been clear cut. Large rocks were hauled in to stabilize the road across the meadow and many of those have tumbled down the meadow, obscuring the designs of the springs that were an important part of this site. I haven't gone up to the cairns yet. I'm just below. I can see the one on top of the rock (knoll) from where I am on the road. ¶ I am amazed that the BLM archaeologist Lyman Deich who knows this site well -- this is BLM land -- allowed this to happen. Seems this archaeologist is a bit dim-sighted to consider the cairns themselves to be the full extent of the site, not the countryside around or the meadow that was the climb to the vision quest place (the journey is as important as the vision). ¶ It is difficult for me to comprehend the changes here. ¶ Out of curiosity I walked in by the road and now that I've made the climb to the cairns, that climb was too easy. Part of the experience is diminished, a good part. 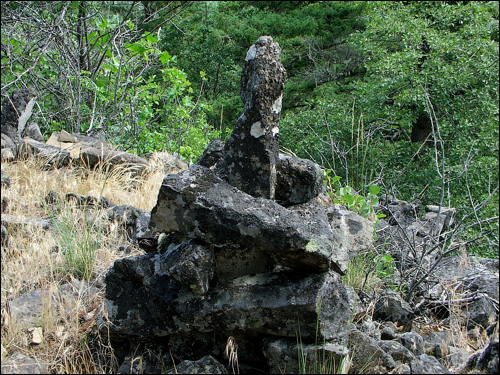 ¶ The 5 cairns (5 is the Takelma sacred number -- vision quests are 5 days and nights) seem intact, though I noticed that the few cairns that are more modern from people still using the site are nowhere to be seen. They have been torn down, more than likely by those who built the road and destroyed the woods, or by those who allowed it. ¶ My first trip here several years ago was in the mist and a light drizzle, the swirls of fog, reaching sunshine and clear skies at the top of the knoll and looking over and seeing Wilamxa [Mount McLoughlin] staring hard this way, floating above the clouds. ¶ Today I can see the mountain clearly -- no clouds -- I can even see snow blowing off the top. I have seen photos taken on the winter solstice of the sun coming up to the side of the mountain over the notch of the hill and lining up with the cairns. It's possible this is a winter solstice site as well as a vision quest site. ¶ Fortunately, there is still some of the power of this place left. Sitting on the knoll I can almost not see the road. Wilamxa looms, wildflowers bloom purple and yellow, the bluejays chatter and the deer move through the woods and across the meadow. And there is a kind of solitude here ("He felt the gnaw of loneliness"), a quiet, and at least the BLM had the sense (or the luck) to gate the road so that there are no vehicles roaring through. 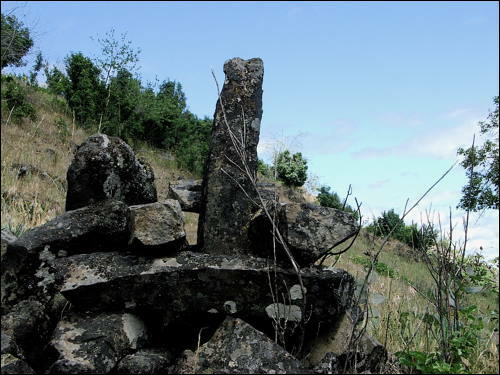 ¶ These cairns have a history in historic times. There was a fellow whose name I can't recall who had a cabin up here before or around the turn of the century, and made a note of the cairns. ¶ From the top I can look SE to a large meadow -- an island in the trees -- that looks like a prime village site or summer camp. Fortunately, most of the hills here still have trees. 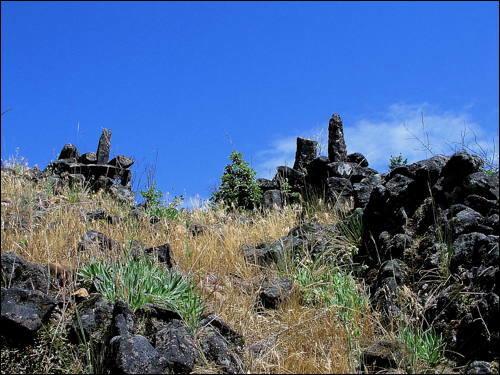 ¶ These cairns are unique among those I've seen in the region, built of stacked columnar basalt with one long piece standing upright in the center as if making a sighting to Wilamxa, making it easier to see something important. 3/10/2019: Wilamxa is the Takelma name -- the short version -- for Mount McLoughlin, the floating mountain, home of Acorn Woman.